In 1971, two brothers living in the Soviet Union named Arkady and Boris Strugatsky wrote a science fiction novel called Roadside Picnic, which would later be adapted into the movie Stalker by Andrei Tarkovsky. In Roadside Picnic, there are places on Earth called Zones where strange anomalies occur. They are incredibly dangerous and put off-limits by the government, but people called stalkers sneak in to try and loot the incredible artifacts the Zones contain. In 1986, the Chernobyl Nuclear Power Plant suffered a catastrophic accident that threw radioactive isotopes into the air, creating a 30km Exclusion Zone that the USSR military forbid people from entering. However, a culture of looters sprang up who would sneak in and navigate the dangers of the Exclusion Zone to scavenge valuable materials. It didn't take long for Soviet people to point out that life was imitating art. The looters started calling themselves stalkers. Humans had created their own Zone. 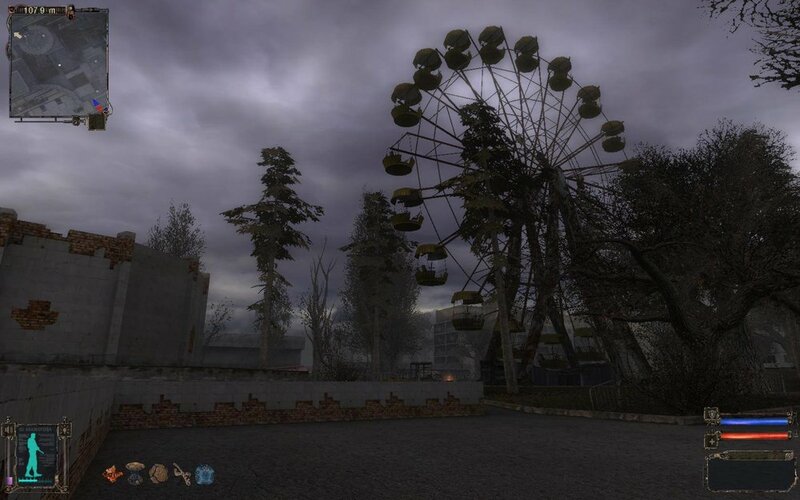 S.T.A.L.K.E.R., an open world first-person shooter by Ukrainian team GSC, brings the actual Chernobyl disaster and the Strugatsky brothers' fiction together. In S.T.A.L.K.E.R., a second Chernobyl disaster fills the Exclusion Zone with physics-shifting anomalies, deadly mutants, and valuable artifacts. You play as a stalker working with the Ukrainian military, investigating an operation that went wrong while surviving the Zone and contending with other stalkers and bandits. If you assume S.T.A.L.K.E.R. plays like any other military shooter with mutants thrown in, you're wrong. While other shooters focus on empowering the player while they mow down hordes of enemies, S.T.A.L.K.E.R. wants you to be afraid of death at all times. Bandits lie in wait to shoot you in the back and rob your corpse. Massive energy emissions called 'blowouts' arrive with only a few moment's notice, turning the sky blood-red and killing anything out in the open. Horrifying mutants have evolved a variety of ways to end your life, like the Controller which can rip your psyche out of your brain before shoving it back in again, and whose mere presence causes you to slowly lose your mind. The most impressive thing about S.T.A.L.K.E.R. is the world. GSC actually went into the Exclusion Zone to photograph the area, and their versions of Chernobyl and Pripyat are based on the real thing. You wander across blasted landscapes surrounded by ruined Soviet-era architecture, peeking into abandoned buildings to see if you can salvage some radiation medicine without alerting the mutant you hear clattering about. Sometimes you might see something you recognize from photos of Chernobyl, like the Ferris wheel or the grid-like radar antennae, and remember that this fantasy you're playing isn't far from reality. Chernobyl really is uninhabitable, and the nuclear accident killed anywhere from several thousand people to 1.4 million depending on who you ask. Unlike other recommendations, I don't know if I can say you should play S.T.A.L.K.E.R. It really is quite an unforgiving game, and it's slow, and you do a lot of wandering. However, I do think you should be aware of its existence as it is an example of how, eerily enough, fiction can cast a shadow on reality.